Can anything be heard over the screaming? When did all this start? When did our American society become so divided? And when did our people become so angry with each other? A pessimist might say it began at our nations founding when a two-party political system was established. Founding Father John Adams, our nations 1st Vice-President and 2nd President as well as co-editor/author of the Declaration of Independence warned us against such a system. John Adams said: There is nothing which I dread so much as a division of the republic intotwo great parties, each arranged under its leader, and concerting measures in opposition to each other. This, in my humble apprehension, is to be dreaded as the greatest political evil under our Constitution. Some might say division of cultures with the Civil War was never resolved and those divisions continue to this day. It’s hard to argue that men and women think differently which is why most men are Republican and most women are Democrat. So, perhaps our slow decline began in 1920 with the ratification of the 19th Amendment giving women the right to vote. Prior to then our nations leaders were chosen almost exclusively by white men whose interests and ambitions were not too different one from the other. True political division was seen in the 1960s and that might be the beginning of all of today’s troubles. It is when many historians say America’s government stopped trusting its people, and people stopped trusting its government culminating emphatically with the Watergate scandal. I tend to think today’s specific problems began more recently. In 1992 after 12 years of relative progress in worldwide peace, the end of the Cold War, racial relations, and economic well-being we elected Bill Clinton President. Republicans were furious at losing the White House to a small state Governor with serious personal-morality flaws who took the highest seat in the land having received only 43% of the vote. They saw it as a stolen election with Ross Perot taking what they felt was rightfully the votes of President George H.W. Bush. And to make sure the anger and resentment was shared equally on both sides of the political aisle Democrats were enraged eight years later when in 2000 Bush’s son won the Executive Office in the closest election in history. Historians have calculated that George W. Bush beat Democratic nominee Al Gore by less than 200 votes in Florida only after a Conservative Supreme Court ruled that the Florida vote recounts must stop. And the win in Florida gave the whole nation to Bush. As an older white man I hold a pretty unique point of view on society and race relations. While not exclusive, I am one of a very small minority to have lived and experienced the variety that comes from three very different and divergent cultures. I was raised in an upper middle class almost exclusively white city of Bellevue, WA. My parents and grandparents were all American born with German ancestry. Our traditions followed the American-European traditions of my ancestry in faith, (we’re Christian) in politics, food, dress, celebrations, etc. 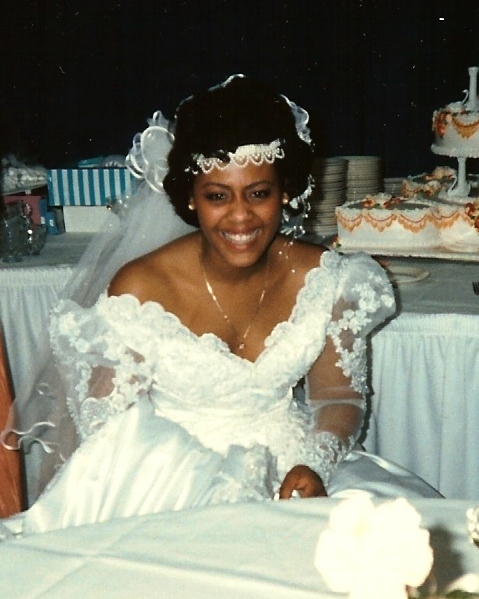 At age 23 I married a black woman. 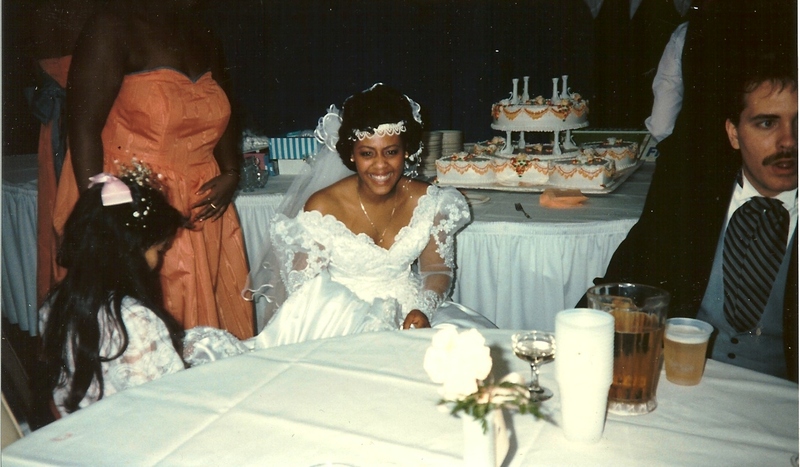 For 28 years I was closer to her black family and their traditions and customs than I was to my family and traditions. And yes they varied. Not a lot. But the differences and certainly the beliefs were distinct. Sadly my marriage ended, and while not entirely or even largely, I believe my ex-wife’s ardent devotion to Barrack Obama (as with nearly all other black Americans) and my opposition to him began to divide us ultimately leading to the dissolving of our union. Her total commitment to him was so unmoving that I strongly believe she began to look at me differently and more critically. Does finger-pointing and yelling ever lead to resolution? I have since been blessed to meet and love a Mexican woman and to receive her love in return. It’s been an adventure and sometimes a challenging one learning her culture and traditions. But it has been instructive. Here is the single most obvious societal and cultural fact I have learned about my life with whites, blacks and Hispanics: WE ARE SEPARATE. We may live side by side, and in most large cities in this country we do. But we are as separated as if we lived oceans apart. Not surprisingly blacks like to hang out with blacks, whites hang out with white people, and in my view to an even MUCH larger degree Hispanics congregate with other Hispanics. And while I have no experience living with and co-mingling with Asians I don’t think its a stretch to say Asian people like other Asian people. Right? So is this a problem? Obviously the answer is yes it is…and simultaneously no it is not. It’s a problem because we all reflect to some degree or another that which we are most frequently exposed to. And if our exposure is limited to our own minority (or majority) ethnicity, traditions, beliefs and cultures our actions, words, and beliefs will be reflective accordingly. And the problem with that is we tend to look at other cultures and traditions and beliefs as different (which they are) and bad or evil (which they are not). They’re just different. I’ll give you one personal example. My beautiful Mexican lady and I have celebrated 2 Christmas’ together so far. And MY tradition of Santa Claus being part of Christmas is not only not celebrated by my lady-love, it’s actually a point of antagonism. Mexicans don’t celebrate Santa Claus; nor do most other countries or cultures in the world. She explains that the Mexican tradition is to teach children that Baby Jesus brings them gifts on Christmas eve. She looks at Santa Claus as evil because it takes away from the true meaning of Christmas, which is to celebrate and worship the birth of our Lord and Savior. She feels so strongly that she won’t even use gift wrapping paper or holiday cards with Santa depictions. Conversely, I too celebrate the birth of Jesus. But I look at Santa as a magical tradition dating to the true story of Saint Nicholas and representing everything that is good…love…generosity…sharing…charity. Our loving, peaceful life together depends on each of us respecting each others traditions. I can’t expect her to ADOPT all of my traditions. Nor can she expect that of me. But in this example and other unmentioned ones our survival as a happy couple requires that we listen to each other and accept the differences and embrace as many of them as we’re able. How is this different from society at large? I maintain that it isn’t. Based on what I’ve seen in these three different races and cultures that I’ve experienced in my life I think its foolhardy to expect blacks to change who they predominantly choose to hang out with and get their points-of-view from. Same with Hispanics. It’s the same for white people…but liberals seem to think this fact makes white people racist. It doesn’t. It makes them normal human beings. So finding a solution to the political and racial tensions in this country is as simple as finding collaboration between two people enjoying Christmas together and with family. As simple as a man who loves football and a wife who doesn’t co-existing 5 months out of the year. As simple as a rock-n-roll fan and a country music fan cohabitating. Open your present from Baby Jesus Christmas Eve and then tear into the stockings Christmas morning. Watch your football alone or with friends while your non-football fan wife goes shopping or to the Salon. Listen to your Rush, Led Zeppelin, Journey or Fleetwood Mac on your time while your partner listens to Shania Twain, Garth Brooks, Rascal Flats or Sam Hunt on their time. Then take turns when your together or don’t listen to anything at all…except each other. It’s clique, but its true. The things that unite us as Americans far outweighs the things that divide us. Be generous, be accepting, compassionate and empathetic. When faced with people who think differently than you listen and avoid anger. Some may think more emotionally; some may think more logically. Some may base their thinking on their beliefs and traditions and what they’ve been taught. It’s important to remember its different from what you’ve been taught. And you will never change their mind yelling and pointing fingers. You might win them over if you just accept them, wish them well, live and let live. May God be with you all and bless your lives. April 4 on any year’s calendar has two meanings to me. Both are important and both are related. To the rest of America April 4th is the day in which Doctor Martin Luther King Junior was assassinated on a motel terrace in Memphis, Tennessee, 45 years ago today. While his greatness is undeniable; his martyrdom sealed with absolute certainty that he would never be forgotten. April 4th is also my wedding Anniversary. The best day of my life was when Miss Sonja Fleming agreed to love me and keep me and honor me and wear my ring for the rest of my life. Twenty-six years later we have enjoyed lots of love and traditions, made our own traditions, raised three kids and stayed together. The staying together part is wonderful and a blessing. But I think my wife would agree it wasn’t a fairy tale. As with all successful marriages we’ve overcome some challenges; though we had more than many. These two anniversaries are related in that Sonja is black, and I am white. At the time of Martin Luther King’s death such a union was extremely rare, and socially unacceptable in the eyes of most Americans. In 1958 only 4% of Americans approved of interracial marriage. 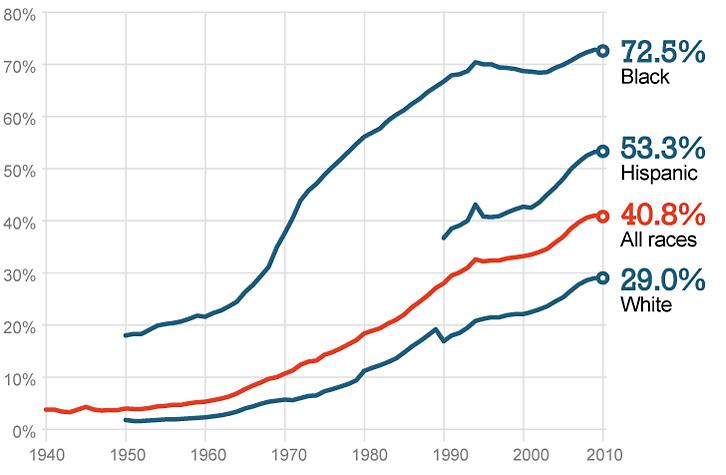 By 1968 that figure had only grown to 20%. At that time it was only one year removed from the U.S. Supreme Court making it legal for people of different races to wed. Remarkably there are still 16% of Americans who don’t approve of my marriage. 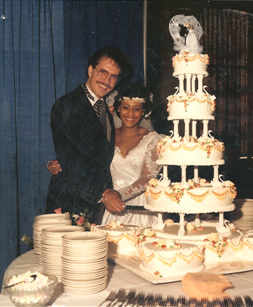 Something I share with my children all the time is the fact that in 1987, when Sonja and I said our “I do’s”, interracial marriage was still rare and still disapproved of by most Americans. I tell my kids this, and they nod, but I can tell they haven’t a clue. How could they? But even those who are my age or older have forgotten what pioneers we were and what obstacles existed as late as 1987. I maintain Martin Luther King’s death made our marriage and it’s longevity possible. His death was so horrible and so universally scorned that even the hateful racists or the indifferent idiots were forced to shut-up over changes that happened far too slowly. Much to my embarrassment and frustration my father was one of the majority who didn’t approve of the marriage of a white man (especially his son) to a black woman. Eight years later my brother married a woman of Philippine decent. And my Dad showed no signs of disapproving. At the time I asked why it was wrong for me to marry a black woman but OK in his mind for my brother to marry a woman with darker skin, and asian. To his credit my father said , “You were Jackie Robinson. You showed that it’s OK”. I loved him for saying what was possibly the very best thing he could have said. Funny how that happens. Things change in society. Some are decidedly bad. But some things we only think are bad at the time change is occurring. Time and example prove the changes were OK at worst, good at best. In other words, the masses are often wrong. 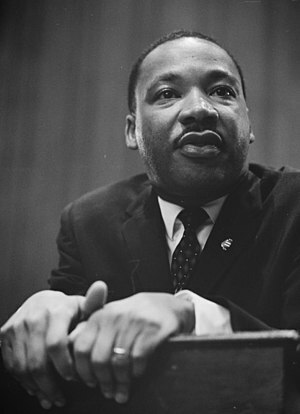 I was only four years old at the time of Martin Luther Kings death. But by the time I was 19 Ronald Reagan had signed a bill into law creating a national holiday in his name. Funny, that was opposed too. President Ronald Reagan and the Signing Ceremony for Martin Luther King Holiday Legislation in 1983. Race in this country is sadly still a huge issue. And being on the front lines of the issue for more than 26 years I can tell you how sad I find it. For there can be no denying that the ugly face of racism still exists. But I don’t believe it hampers the advancement of most African-Americans from achieving their dreams and goals for success. I do believe the belief, in and of itself, by many blacks that racism holds them back is in fact what holds them back. Dr. Benjamin Carson received for speaking of Conservative Christian values at the National Prayer breakfast in front of President Obama to know I’m somewhat doomed. Race in this country can live up to Martin Luther King’s dream when and only when African-Americans collectively recognize that racism will never be fully eradicated. Idiots and hate have existed throughout history. But to point accusatory fingers at every person and incident and scream “racism” at every slight only frustrates everyone and keeps innocent people on the defensive and pushes them away. For instance, today’s higher rate of poverty among blacks is less the result of societal racism and more the result of the astounding rate of single-mother and teen births. A graph showing percentage of single mothers by race. As of 2010 72.5% percent of black children are born to single mothers. It’s 29% for whites, 53.3% for Hispanics. Not one single white person, racist or not is responsible for this horrible fact. And it’s horrible because 64% of single mothers and their children live in poverty, regardless of race. Progress has been made in race relations since the death of Martin Luther King and since the 1987 marriage of Sonja and I. A black President with a traditionally Muslim name is fair evidence of this fact. But on this day every year, I want more and better. And from this non-racist white guys perspective the African-American collective bares the burden of making this happen. Not entirely, just most of the heavy lifting. 25 Years Since My Life Began…and A Lot Has Changed. This Holy week is particularly special because I will be passing a milestone of tremendous significance to me. April 3, 1987 was the last day I spent in my life as an unmarried man. Put another way, my 25th wedding anniversary is April 4th. I won’t bore you in this blog telling you how I love my wife, I do. Or how scared I was that wonderful day, I was terrified. It’s not necessary for me to wax-on about the many happy times we’ve spent, there are plenty. And I need not tell you of the commitment required from a man and a woman to stay married this long and however many more years we’re fortunate enough to enjoy together, total commitment. But my reflective nature did think it was important to write about a significant change that has occurred in the last twenty-five years. Most notable is the fact that my marriage exists at all, and that no one (seemingly) has a problem with that. My wife is black, I am white. And this fact is nearly meaningless today. This was not the case when we exchanged vows in Seattle, WA in 1987. We were a rarity. And we were a controversial rarity. My Dad was not shy in expressing his opposition to my marriage specifically and to interracial marriage in general. He told me. And in one sad and pathetic and somewhat funny telephone conversation he told my soon to be Mother-in-law. My Dad later claimed to have had too much to drink one night a couple of months before the wedding date when my would-be Mother-in-law called him on the phone to invite him to take a more active role in planning the wedding of her daughter to his son. As was told to me later he told her he was not interested in participating, or even attending the wedding. As the story goes he proceeded to clumsily explain to her the few times in his life where he felt he’d been “hurt” or “damaged” by people who were black. My Mother-in-law, being a strong and smart woman, quietly listened. And when he had finished his pathetic little rant she calmly asked, “Now, would you like to hear all the times white people had “hurt” me?” Having been born in Alabama in 1940 it didn’t take a PHd in Sociology to figure her list was long and severely more substantial than whatever my Bellingham, WA born Father was able to muster. He sheepishly declined to hear her tales. And he did attend our wedding. Though he told no one in advance that he would do so, and when my bride and I first became aware of his presence at our reception it was a pleasant surprise. He was one of the very few of my family members to attend. The cousins I grew up with and celebrated every Christmas, Thanksgiving, 4th of July and other holiday’s and special events didn’t come or send gifts or cards. My Nana, my Dad’s mother, likewise failed to come or acknowledge our wedding. One of my two Aunt’s, one of my Uncles; none attended my wedding or acknowledged it in any way. marking the first time in television history that a white person kissed a black person. According to a 2010 CNN report interracial marriages were at an all-time high making up 14.6% of all newly married couples. That’s up from 6.8% in 1980. The report does not distinguish what races or ethnicities make up the interracial couples. A report in the New York Times from just 1 year ago says of every 1000 marriages white men marry black women only 3 times, versus 19 Hispanic women, 14 Asian, and 947 white women. So even now we remain an oddity. But fortunately, a much more accepted oddity. It’s fair to say that some people have a predisposition attraction to people of a certain race, and at times a different race. That’s fine; and I find no fault with such predispositions. It just doesn’t apply to me. I wasn’t then, and am not now particularly attracted to black women. I am predisposed to be attracted to attractive women, no matter their race or ethnicity. Such is and was the case with my beautiful wife. I didn’t marry her because she was black. I also didn’t marry her because she is attractive, though she is. I married her because she laughed at my jokes, and because I thought she was one of the most genuinely kind people I’d ever met. She still is. Categories: National Politics, Uncategorized, Washington State . 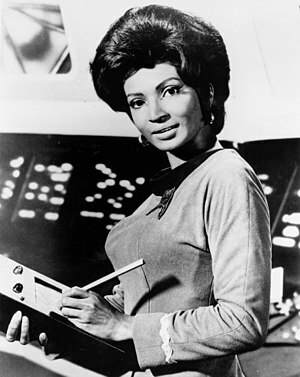 Tags: 25 year anniversary, biggotry, ethnicity, Father, growing old, Interracial marriage, James T. Kirk, Marriage, New York Times, Nichelle Nichols, prejudice, race, race wars, Seattle, Uhura . Author: Michael Schuett . Comments: Comments Off on 25 Years Since My Life Began…and A Lot Has Changed.